Editor’s note – This article was published in 2007, many of these devices have become a victim of technical obsolescence. The reviews here can still apply to many of these units as they are available frequently on the used market. Many of the reviews here also have relevance to the modern incarnations of these devices. Record players and VCRs will always have a special place in our memories. But eventually it makes sense to take advantage of superior technology, especially if it offers superior performance. Thus the dominance—for now—of iPods and DVD players. While I don’t entirely disagree—basic map and compass skills should be part of any explorer’s repertoire—you could easily extend that logic to your vehicle. What if the engine dies? Should you ride a mule instead against such an eventuality? The latest consumer GPS units include features such as chipsets that can consistently acquire your position within seconds after powering up the receiver; accuracy to within 15 feet; signal retention even under tree cover and inside buildings; removable flash memory cards that allow you to carry virtually unlimited map data with you as you travel; fast processors that allow complex data to smoothly scroll across the screen; aerial imagery and surveyed topographic maps; and brilliant full-color screens. Some consumer-level handheld units are now capable of displaying real-time National Weather Service radar data, or traffic information for congested metropolitan areas. There are currently two types of systems that make sense for a four-wheeled vehicle (or “cage“ as the dual-sport riders call them). The first is a computer-based (PC or Mac) system with an external GPS receiver, along with mapping and navigation software. The second is an all-in-one unit (although external accessories may be available). Due to space considerations, motorcycles are restricted to the latter unless the rider goes to considerable lengths to work up a PDA (personal data assistant) device that can withstand the rigors of adventure riding. For this review, we concentrated on compact stand-alone units that can be mounted on either two- or four-wheeled vehicles, with a prerequisite of topographic mapping capability for backcountry adventures. The advantages to these units over a linked computer system include compact size, lower weight, fewer controls and connections to fuss with, and a simplified interface (in most cases). We’ll address the topic of laptop/notebook computer-based units in a future issue. Special thanks goes to Overland Journal contributing editor Brian DeArmon for assistance with the testing and evaluation of these units for use with dual-sport motorcycles, and to Sharon Marzonie for assistance with the evaluations and photography. Perfect for a tough 4WD rig, but maybe a little big for a motorcycle; definitely too big for packing around on foot (and no internal battery should you wish to try). That pretty much sums up where the Baja 540C will fit into your overland lifestyle. Dual-sport riders are not necessarily excluded from using this one, but it requires a fair amount of space and is not convenient to remove and take with you or lock away in a pannier. I had the pleasure of learning how to program and operate the 540C in preparation for the Tecate Score Baja 500 this year, and used it to prerun several sections of the course in a Toyota truck. The large, vivid, full-color screen is certainly the best in this review. Coupled with Lowrance’s top-notch map graphics quality, it’s easy on the eyes and the safest for reference while moving. (But none of us ever looks at a GPS screen while moving, right?) A night-mode color scheme attenuates the otherwise harsh brilliance of the screen in the dark. The unit is solidly constructed and comfortable to use. Well-spaced, large, rubberized buttons and rocker control facilitate operation with gloved hands or on a bumpy road. A particularly smart feature is the rangefinder, which is optionally shown on the map screen as circles of varying diameter at given mileage (or kilometer) intervals, centered on your position. It is an excellent way to quickly estimate approximately how far you are from various features on the map. Likewise, a compass overlay can be shown on the map screen for a quick reference to your heading. One feature I consider absolutely brilliant is the ability to use the “exit” button to toggle back and forth between the current position you are viewing on the map and the position where you left the cursor before panning the map. I wish all GPS receivers could do this. A feature that is probably intended for avionics use is an up-timer and down-timer. This can be set like a stopwatch and alert you with an alarm at preset intervals, which could be useful in a 4WD vehicle for reminding you to turn off your auxiliary fuel pump switch, or to assist you with timed laps in a competitive event. The access door for the SD/MMC memory card is located on the front of the unit, which is very convenient and doesn’t require dismounting every time you need to access the card. Three cables with threaded pin connectors plug into the back of the unit—and unfortunately all are required for proper operation. This means that riders and drivers alike will need to be careful to check fitment and have a place to stow or secure these cables. One of the cables connects to the external antenna puck, which is required for GPS satellite reception (there is no built-in antenna). The others supply power and network data, but the network cable also tees into the antenna and so must be connected even if you are not plugged into a multi-screen system (as in some marine applications). Memory storage allows for 1,000 waypoints, 1,000 event markers, 100 routes and 100 plot trails (tracks) with 10,000 points per trail, which is more than any other unit we tested except for Lowrance’s own iFinder Expedition C. This is perfect for a high-mileage expedition route through multiple regions, states, or countries, and is one of the main reasons Lowrance products are so popular with off-road and rally racers. Topographic and street level data is very good using the MapCreate Topo 7 software, and I will cover some of those details in the following review for the iFinder Expedition C.
Best screen quality of the review: full color and daylight-viewable with excellent high-resolution graphics. Removable SD/MMC card memory storage. 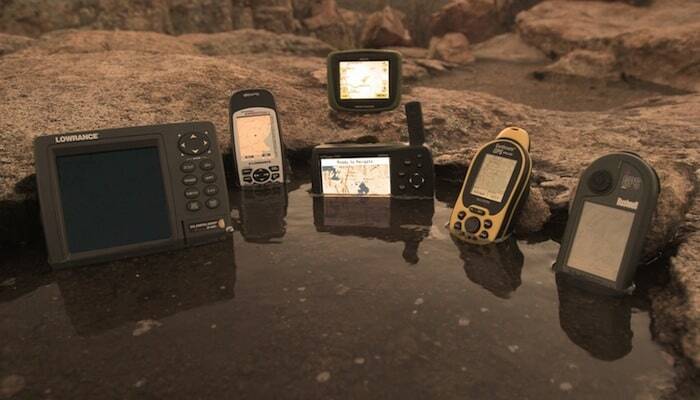 Rugged, waterproof construction (IPX7 standard). Cable connections are solid and use threaded connectors. Well-spaced, rubberized controls are easy to use with gloved hands. Reception is excellent with the supplied external antenna. High-quality mount and body cover/protector are included. Smart navigation aids such as rangefinder rings and compass overlay. Data connection is available for NMEA output to mapping software applications. Too large for many motorcycles, or for non-motorized use. No internal battery for operation away from a vehicle or power source. Required cable bundle is bulky. Bushnell is currently advertising a new unit called the Onix 400, but they did not have one available in time for this review, and reported that they were still finalizing some details. So I reviewed the Onix 200CR, a small unit that is comfortable in the hand and ruggedly built. The unit I tested did not come with a mounting bracket, but compatible RAM-brand mounts are available at the Bushnell online store. Despite this, I soon learned that the Onix is tailored more to pedestrian and single-track use than for serious road navigation. The built-in basemap is a bare-minimum data set, and I do mean bare⎯the city of Phoenix shows only major freeways and a handful of POIs (Points Of Interest). No detailed mapping software is available to provide street-level or POI data for urban or backcountry areas. To view any useful mapping information, you must download files from Bushnell’s website and store them using internal memory, since the 200CR has no provision for removable data cards. The images offered must be purchased ($79 buys unlimited downloads for one year) but are high-quality raster graphics (scanned images) of actual USGS topographical and DOQQ (digital orthophoto quarter-quadrangle) aerial images, so what you see is what you get. Bushnell’s intentions are well placed, but poorly executed. The process required to get the map images from their database onto the GPS is slow and cumbersome. Rather than allowing the user to select an area of the browser-based map using a drag-and-drop method, then showing a subsequent menu of the available maps for the selected area, the user must pan and zoom the map in increments and select one image tile at a time, including the various zoom levels, all of which requires the webpage to reload for each selection. It could take hours to download enough maps for a long-range expedition, and even then there is insufficient memory in the unit to store all of them (when connected to my computer, 27mb of memory was shown as available). As such, I would consider the 200CR most useful to hunters or day-hikers who want to keep track of their position and waypoints in a relatively small area. Track and waypoint management is somewhat rudimentary. While a “breadcrumb” track can be turned on to record your movements, there is no way to save it unless you specifically select “new trail” ahead of time. So unless you plan ahead to save your upcoming track, much like pressing the “record” button on a video camera, you won’t be able to save it as a file. Oddly, existing breadcrumb tracks can be turned on and off, but cannot be erased. Waypoints can be created and used as stops for a route, or navigated to, but they can’t be called up on a menu for editing or deletion unless the GPSR is connected to a computer using the Bushnell CD software. The screen size is generous for such a small handheld unit, and the color range is good. However, the map graphics pixilate at closer zoom levels. The screen brightness is adequate. The position cursor is a very small black and white icon, which gets lost easily on the grayscale aerial imagery. The breadcrumb trail is likewise a very faint dashed line that becomes lost among the bold graphics of the topo maps, or the grays and blacks of the aerial maps. Waypoint icons and text are tiny. One function I really appreciate is a power saving mode that can be used when operating on batteries. The screen will shut off while the unit continues to track satellites and record track data. This is a big plus for backpacking or other situations when you want to maximize battery life. Regardless of the quirks, it’s encouraging to see another company developing GPS units that take advantage of raster graphic image databases, especially photographic imagery. This is the future of GPS mapping because it gives us the option to see an image of what actually exists on the ground. Once you use aerial photography for navigation, you will understand the many benefits this type of imagery offers. It conveys information that cannot always be found on conventional topographic maps. I think that with the development of a better file downloading tool Bushnell is on their way to having an excellent product. I’ll look forward to testing the new Onix 400 to see what improvements have been made. Well-styled, comfortable handheld with rugged, rubberized exterior. Uses USGS raster map images. Range finder rings can be overlaid on the map screen. Compass rose can be overlaid on the map screen. No detailed map database software. No street level data or POIs. Cumbersome map image collection process. Button dexterity could be improved. Side mounted rocker buttons are difficult to work with gloved hands. USB data connector does not output NMEA data for use with mapping software applications. While I’m not crazy about the sparkly plastic appearance of this handheld GPS, the sheer performance and function more than make up for it. Most GPS units have a “vector graphics” look to their displays, either pixilated or resembling an old-school video game, but the iFinder is surely the HDTV of its contemporaries. The display is well-suited to the serious overlander, boasting outstanding colors and crisp, detailed, high-resolution graphics. The precision display is coupled with a well-illustrated map database that—surprisingly—does not bog down the processor. Zooming and panning is smooth as the little machine just rips through the data as though it were a double-digit kilobyte file. Of the units we tested, this one offers the best compromise between auto/motorcycle use and pedestrian/non-motorized use. The graphics, text, and icons are sharply rendered, but they are very small and as such require your eyes to be closer to properly read text and discern details, making mobile use in a vehicle or on a motorcycle only mediocre. Even when plugged into an external power source, the screen is clearly not as bright as its Baja 540c counterpart. Unfortunately, Lowrance does not offer auto-routing software. If that doesn’t bother you, you’ll still find the street-level detail and POI database in the MapCreate Series 7 Topo software to be very useful on a trip. (Whoever designed the POI icons must love Italian food. While the standard restaurant icons is a three-pronged fork, the pizza joints actually show a slice of pizza. You have to love that.) The topographic data is beautiful, with color and shading choices for various data layers. Contour lines and interval numbers are crisp. Peaks, watersheds and springs are easily discernable, even from zoom levels as high as 10 miles. I was surprised to find detailed underwater topographic (depth) contours and navigational aid POIs for large bodies of water included in the standard MapCreate Series 7 Topo (as opposed to the dedicated marine software). This is useful information for the casual paddler, diver or angler. Hunters will be happy to discover that colored sectors for public hunting lands in 46 states are included, and can be turned on or off as a data layer. Like its big brother, the Baja 540C, this unit includes useful features and tools such as the rangefinder rings, compass overlay, nifty position-to-cursor toggle capability, and even an alarm clock. For those who want to take some tunes on the trail, a built-in MP3 player is included, but requires a special adapter for audio output. Available data includes trip computer, compass, barometer, altimeter, and sun/moon information. Best screen of the reviewed handhelds: excellent full-color and high-resolution graphics. Well-designed map graphics and icons. Rubberized controls are closely spaced, but large enough for use with gloved hands. Small enough to be practical for non-motorized use. Uses standard AA batteries (including rechargeable). Display is marginal size for motorized use. This yellow and black handheld unit resembles a bumblebee, and has a similar power to get the attention of and impress anyone in close proximity, despite its small size. Many readers are already familiar with DeLorme’s excellent mapping software programs, “Street Atlas USA” and “Topo USA.” While Topo USA contains detailed topographical information, it also has an extensive street database that can be used for data management, route planning, and creating maps for the PN-20. DeLorme’s sophisticated Xmap 5.2 GIS software is also now compatible with this unit. The qualities I appreciate most about the DeLorme products are their cohesive capabilities and well-rounded features. Their products complement each another, and the sum of the individual parts makes a satisfying whole. The PN-20 can be optionally packaged with heavy-duty auto or motorcycle mounts (made for DeLorme by RAM), Street software with auto-routing (which will direct you to a pre-set destination), Topo software with terrain data, and a memory card reader with SD card. The optional Power Travel kit includes a single USB cable that uses click-on adapters for data transfer or external power hookup (120VAC and 12VDC), and a 3V 1300mAh rechargeable lithium-ion battery pack with charger. Alternatively, the unit can operate on two AA batteries of any type (including rechargeable). The travel kit also includes a carrying bag, and even a set of screen protectors and a cleaning cloth—a nice touch. The screen protectors work adequately, but detract from the screen quality. The effect is difficult to describe, but has the appearance of translucent dots densely packed onto the surface of the screen, resulting in a fuzzy effect. If the integration with Topo USA isn’t enough, the PN-20 can also display raster image files of real, honest-to-goodness 7.5 minute USGS topo quad maps, black-and-white DOQQ aerial imagery, and Sat-10 color satellite imagery, all available via download from DeLorme’s website. The bottom line is, you not only get detailed maps with a POI database and routable street navigation, you can also view your position as it exists on a paper topo map, aerial photo, or satellite image—in the palm of your hand. In a word, amazing. When you think about the amount of information stored inside this little device, it boggles the mind, especially since the data is not just sitting idle on a chip; it must be accessed and processed at a moment’s notice. And this where the PN-20 struggled a bit. Unlike many other GPS map screens, as you move, the cursor moves across the page (rather than the page moving beneath a centered cursor). As the cursor nears the edge of the screen, the map must be redrawn to continue. This results in map scrolling that is inconsistent and not always smooth. The closer you are zoomed in, and the faster you move, the more quickly the cursor moves across the screen, resulting in more frequent map regeneration. In a vehicle, with the unit zoomed in close enough to discern street names or topographic details, the cursor moves rapidly indeed across such a small screen. Often by the time the map redraws itself the cursor is already a quarter of the way across the refreshed screen. This makes the map generation process much more amenable to pedestrian use than to motorized travel, unless you’re in low range. A word on map files: Although the ability to use so many types of maps is enticing, be prepared for a steep learning curve. You’ll need to invest some time into learning how to properly “cut” your custom maps and use them most effectively. There are some limitations as to what maps you can see at various zoom levels, and although the menu allows a user-selectable layering order, I still could not get certain maps to show up at particular zoom levels. I also noticed an odd condition when I had raster files loaded: Certain areas would show blocks of white space instead of map data until I zoomed in closer than the 0.5-mile level. When the map is zoomed out beyond a level of 4.0 miles, there is practically no detail shown. Only major highways, cities, and large bodies of water are visible. Because the PN-20 integrates with the DeLorme mapping software, you can customize your map data to include user-drawn items such as shaded polygons (useful for property ownership and usage data) and other shapes, lines, and markers. A generous amount of useful data is available, including route, tracking, and position information, as well as barometric pressure, compass heading and bearing, sun/moon rise and set times, moon phases, and tide data. The user can also customize the data fields and display properties of each screen or “page” on the display. As a photographer, I love the feature that tells me how much time there is to sunrise and sunset (or moonrise and moonset if I wish). One of the two smallest units tested, the PN-20 will be a perfect companion to any ancillary activities once your journey on the road has ended and your adventure by non-motorized methods begins. Weighing a mere 6.8 ounces including batteries, it will fit in most pockets or can easily be tethered to a pack using the molded-in eyelet and included lanyard. Despite close button placement, they are still usable while wearing summer gloves and even winter gloves (a bit trickier). The buttons are well-constructed and tactile. However, while this unit might be my top choice for backpacking or paddling, the tiny screen is not as useful on a motorcycle or in an automobile. If DeLorme could package all of these comprehensive features with a screen size at least 50% larger, along with a faster processor and more space for button controls, they would have a fine product for the dual-sport market. 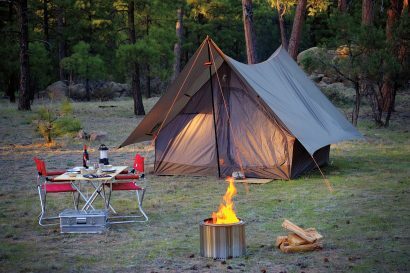 DeLorme is obviously confident in its products, as it is the only manufacturer in this review to host a full-fledged user discussion forum on its website. The forum is very active and contains a wealth of information, from tips and tricks to troubleshooting to tutorials about the products. DeLorme also invites feedback and suggestions to improve their products and better understand their customers. For this I applaud them, and suggest that all GPSR manufacturers take DeLorme’s vigorous forum activity as a cue and follow suit. Uses USGS topo and aerial imagery. Customized map data (shaded polygons and drawn objects). Uses AA Batteries or DeLorme battery pack. Color screen with sharp resolution for raster images, daylight-readable from any angle. Detailed sun, moon and tide information (great for photographers). RAM mounts available directly from DeLorme. Cable connections are solid and vibration-resistant. Screen is too small for motorized use. Button placement is tricky with gloved hands (for dual-sport riders). Map scrolling is slow when used on paved roads. Specific data display is not always available at various zoom levels. Topo USA software 3D features are not compatible with some newer graphics cards running on Windows Vista (which might not be DeLorme’s fault). Garmin has been an industry leader throughout most of the history of the civilian GPS market, and the 276C is a perfect example of why. This is a versatile product with complete map data sets for both urban and backcountry exploration. A removable memory card can be used to store large amounts of detailed map data. The rugged plastic case is small enough to mount easily on a motorcycle, or even be used for non-motorized travel, yet the screen is large enough to be usable while in motion either on a bike or in a 4WD vehicle. A removable, 8.4V lithium-ion rechargeable battery powers the 276C when it is not plugged in to an external power source. It will not accept standard AA batteries. A detachable, pivoting antenna stick with a BNC (bayonet Neill-Concelman) connector resides in the upper-right corner, and must be deployed for proper satellite reception. An optional external antenna can be used in its place for improved signal reception and retention. The 12VDC power cord for automotive use has a pivoting cigarette lighter-style plug with a speaker molded into it which provides (loud) audible navigation prompts when auto-routing. Garmin also sells a power cord for motorcycles that substitutes a 2.5mm headphone jack for the speaker. A felt-surfaced, hard-molded cover keeps the screen and face protected and clean when not in use. The screen has a landscape orientation, which gives it a “widescreen” appearance. A Garmin beanbag mount is available for automotive use where a permanent mount is not desirable. (However, Overland Journal’s conservation editor Roseann Hanson, who used this combination to map a new tourism route through southern Kenya, reports that on an exceptionally rough road the unit bounced off the beanbag and, in fact, right out the window, only tethered by its power cord.) More secure 4WD and bike attachment is available via mounts from Garmin, RAM, and Touratech. Both City Navigator maps and Topo U.S. maps can be stored on the memory card simultaneously, but you must use the map management menu to access them, since only one or the other can be displayed at a time. Somewhat frustrating is the fact that any time you upload map data to the card, it erases any existing map data (although not waypoints, tracks, or route data). A better approach would allow the user to store various map sets on the card so they could be called up as needed without having to recreate and reload them. Unfortunately Garmin still insists on using proprietary memory cards, which are inconvenient for the world traveler who wants to keep backup copies of data, share files with friends and associates, or purchase additional memory from an outside source. The City Navigator software will only activate with an unlock code supplied by Garmin—even after you have paid for it. I found the code retrieval process unclear, and I ended up having to search the internet and Garmin’s website to get a solution to the problem. The new version of Topo U.S. 2008 is a different story, however, and hopefully a sign of things to come, as it did not require any unlock codes to work properly. Now if we could just get Garmin to start using standard SD cards. . .
Auto-routing for streets is possible with the City Navigator software, and even when routing is not active, it’s easy to keep track of your progress with a heads-up display. At the top of the screen your current direction of travel and street is shown, and at the bottom the next street or highway exit is displayed along with the distance to that point. The turn-by-turn voice guidance on the Garmin seemed a bit weak by comparison to the Magellan Crossover. The female voice is pleasant enough (luckily she doesn’t sound like a robot), but she doesn’t announce street names and highway exit numbers, only the distance and direction to turn. This can leave you guessing when street intersections or highway exits are spaced closely together. You’re supposed to be able to use auto-routing while in topo map mode, but the short routes I tried proved fatal for the voice guidance system. The woman’s voice kept telling me to turn the wrong direction and then repeated “recalculating route” with a “ding-ding” tone like a broken record. It was quite maddening. Once I switched from the topo map to the city map, all was well. Topographic detail and POIs are plentiful, showing many hiking trails and single-track routes as well as unimproved roads. Topographic contour line intervals vary depending on the area. The intervals tend to increase in mountainous areas (which avoids crowding the lines too close together) and decrease in flatter terrain. Something to note is that the new 2008 version of the topo software features shaded relief when viewed on a computer screen (unfortunately not the GPS screen). This is helpful in discerning the terrain while planning trips from home or on a laptop at base camp. One feature I particularly enjoy is that when panning around the map screen to create a waypoint, the cursor will snap to POIs, roads, intersections, or contour lines with fly-out text and a highlighted outline so you can positively identify what you are about to select. The 276C nearly rivals the Lowrance Baja 540c for the best screen of the review, displaying exceptional color, clarity, and brightness, with full daylight-readable capability. Large enough for use while driving or riding, the screen is even easy to see while wearing polarized sunglasses. A night-viewing mode is available, either manually or automatically, and text sizing is adjustable to suit your preference. A multitude of ancillary data and customized user settings is available, including statistical information such as a trip computer and satellite reception status, as well as informational tools such as a compass, sun/moon data, graphic tide charts, and a calendar. High-quality TFT color screen and display is daylight readable. Well-spaced buttons are easy to operate with gloved hands. Heads-up on-screen display of street names and direction of travel. Cursor snaps to objects and identifies them, simplifying waypoint creation. New Topo U.S. 2008 software doesn’t require unlock codes, and includes shaded relief for maps on a computer screen. Good aftermarket and accessory support. Data connection is available for NMEA (National Marine Electronics Association) output to mapping software applications. Auto-routing should be improved, to work with topo maps. Voice guidance should be improved to include street names and highway exits. City Navigator software still requires unlock codes. Non-standard batteries (proprietary battery pack). The Crossover is essentially one of Magellan’s RoadMate automobile GPS units, with the addition of a removable rubber cover and topographic mapping capability. While it might not originate from an overland-specific design, it adapts pretty well to dual-purpose use. The big bonus to the interstate road-tripper is the ultra-convenient Navteq on-board touch-screen auto-routing capability with voice guidance, which is terrific for navigating urban areas and has surprisingly good coverage of dirt roads as well. I used it to successfully auto-route from the highway near Lake Tahoe all the way to Loon Lake at the start of the Rubicon trail in the Sierra Nevada Mountains. However, street-level navigation guidance is where this unit really shines. A pleasant female voice offers turn-by-turn directions and even calls out street names and highway exits. If you stray off course, the computer’s ability to recalculate the route is quick and efficient. If you are navigating along a highway, the unit detects when you exit to an off-ramp and will suggest that you get back on the highway. I found this remarkable considering the inherent minor inaccuracies associated with GPS map data and fuzzy satellite positioning accuracy; you would think a GPS would commonly think you were straying from the roadway. My guess is that the unit may deduce that you have exited the freeway based not only on the variance in position, but a swift reduction in speed. If you ride a motorcycle, you can tap into the audible navigation prompts using a 2.5mm headphone jack on the side of the unit. Likewise, if your vehicle stereo has an input jack, you can listen to the voice guidance on the stereo speakers using an audio connector cable. The computing format separates the maps into two distinct categories: “Driving” and “Outdoors.” For us, that means paved roads and urban areas versus dirt roads and topographic areas. When either format is selected with a touch of the screen, the appropriate map graphics pop up. Common streets do show up on the Outdoors maps, but information and POIs are more limited, and the auto-routing function is not available. Streets may not be visible unless you zoom in to the 0.5-mile level or closer. The built-in maps contain topographic contour data of all 48 contiguous states in the U.S. (some areas highly detailed using 3-meter intervals) but POI data showing streams, peaks, springs, etc., is not present. The owner’s manual states that these details can be loaded onto the unit by purchasing pre-loaded SD cards with Mapsend Topo data on them. However, when I visited the Magellan site to see about purchasing one, they were not available. The literature states specifically that custom maps created with Mapsend Topo CDs or DVDs will not work with the Crossover. Perusing the Magellan website, I did find several SD cards available pre-loaded with Canadian topos, Mexican topos with street data, and marine charts. The Crossover’s touch screen works very well for urban use, taking advantage of the POI database, address, and auto-routing functions. It’s a welcome change to be able to type waypoint names and street addresses using a keyboard instead of a rocker switch. 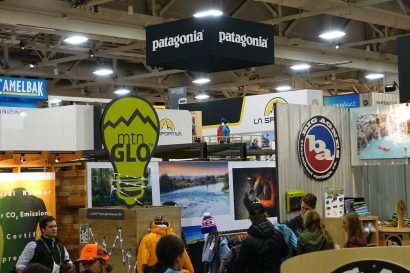 For backcountry use, however, it becomes a bit clumsy, since panning the map with your finger on the small screen inadvertently calls up other screens and menu items by accident. In direct sunlight, the touch screen material has a wax-paper appearance, and map visibility becomes mediocre. Dust and dirt could become problematic over time, especially with gloved hands that will retain dirt particles and drag them across the surface. Screen performance is poor when using gloves (especially winter gloves). The graphics have a cartoonish appearance, and map details look somewhat bulky and pixilated. Various color schemes are available for both menus and maps, and a high-contrast night mode is included. The dimensional ratio of the screen (almost square) works well with either track-up or north-up orientation. A built-in speaker on the back of the unit is easily audible, and can be muted or output to external headphones. Two features not related to navigation are an MP3 music player and a photo slideshow utility. A downside for non-motorized use is the lack of a battery compartment that will accept standard batteries. 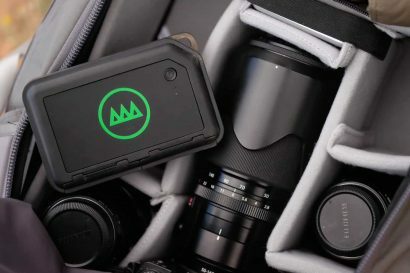 The Crossover has a built-in, rechargeable lithium-ion battery, and although it has exceptional longevity, it doesn’t lend itself to multi-day adventures without an external power source. Touch screen is convenient for navigating menus and typing words. Good colors and graphics with different color schemes available. Comes with a sturdy windshield mount (for automotive use, but could be adapted to a motorcycle). Excellent auto-routing and address database for street navigation. When entering address data, only letters available for potential street names in the search area appear on the keyboard, thus saving time and simplifying input. Dual-purpose unit for both streets and topographic maps. Removable memory allows additional data storage. Touch screen can be awkward for panning topographic maps. Graphics are difficult to see in full sunlight. Touch-screen buttons in corners of screen can be stubborn to activate. Touch screen is prone to damage from long-term off-road use and contamination. Proprietary battery is not removable (cannot carry spares). Rubber cover slips off too easily. Only has an IPX4 rating (water-resistant). No topographic POI database available at time of review. With screen size as a paramount consideration, the Bushnell Onix 200CR, DeLorme PN-20, and Lowrance iFinder units seem best suited for non-motorized travel. The iFinder has the best display quality of the three. The DeLorme is a fine choice, thanks to its extensive mapping capabilities, combining satellite and aerial imagery as well as auto-routing on the same unit. We’re looking forward to seeing what Bushnell comes up with for its new Onix 400. This leaves the Garmin GPSMAP 276C, Magellan Crossover, and Lowrance Baja 540c as the top contenders for motorized use. Each excels at being visible while underway. The Baja 540c has the largest screen and best visibility, with the Garmin in second place, followed by the Magellan, due to the durability issue with the touch screen, and poor daylight visibility. However, screen quality isn’t everything. The data displayed on that screen is equally important, and the Lowrance falls behind here by not including auto-routing capabilities, despite the additional handicap of being too large to be practical for many motorcycles, and definitely not appropriate for non-motorized use. This leaves the Magellan Crossover and Garmin 276C, each of which is an excellent product depending on user preference. The touch-screen capability of the Magellan makes menu navigation and user input the easier of the two. My wife, who could be considered a digital-mapping and GPS novice, liked the Crossover immediately, and was able to use it out of the box without reading the instructions, taking advantage of the audible turn-by-turn instructions to guide her around unfamiliar streets on a recent trip to Albuquerque, New Mexico. The menus are simpler to navigate and less distracting than those on the Garmin, and the superior auto-routing and voice guidance renders the Crossover the safest, most effective unit to use on paved roads where traffic is a concern. Despite the intuitive and convenient operation of the Magellan, the Garmin 276C finished as my top choice of the group, as the only unit that solidly touches on every facet of the attributes discussed in this article (with the exception of raster map capability). The Garmin’s full suite of trip-computing tools, comprehensive informational organization, and excellent screen visibility and graphics are appealing and useful to me as a motorized traveler who likes to keep good records of my trips. By using both City Navigator and Topo U.S. software, the mapping capabilities are robust for dual-purpose use. The overall size and weight doesn’t preclude slipping the 276C into your daypack or drybag for a non-motorized adventure. Although the lack of AA battery power is a handicap, if more than a day is needed away from a charging source, spare battery packs from Garmin are available. Mounting options are plentiful, and an external antenna can be used for better reception. If you use the 276C as a receiver for computer-based mapping software, it can transmit GPS data to a notebook or tablet computer via USB connection. Another plus is the large aftermarket and consumer following of the Garmin products. Many accessories and mounts are available, as well as third-party software and data conversion tools.